Continuing the retro radio theme for my sketch session this morning I returned to the radio shop / museum and chose a Philips model which was manufactured in Great Britain, Holland and France between 1930 and 1934. 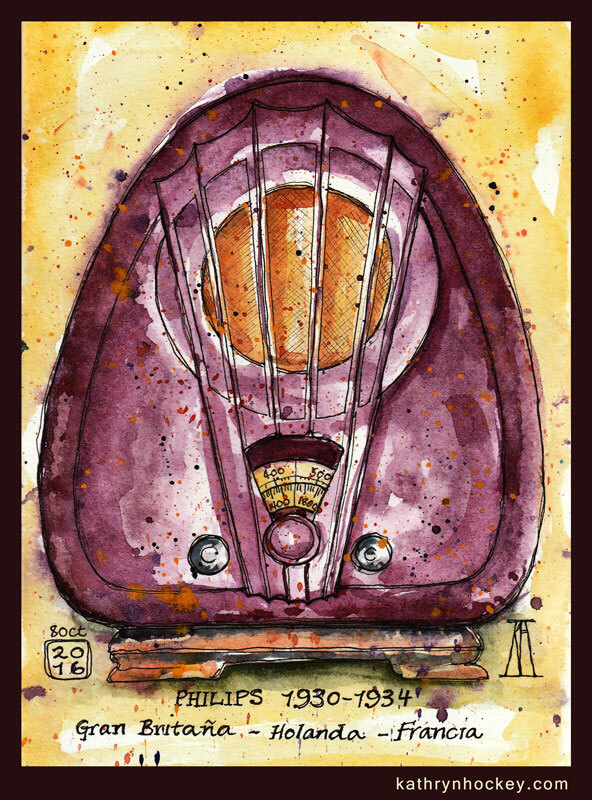 Needless to say I took liberties with the colours…the actual radio was made out of Bakelite, the world’s first completely synthetic plastic, which was invented in 1907 by Leo Baekeland and is actually brown with reddish hues. I felt purple was a more interesting option so I used my artistic license. This entry was posted in sketches and tagged antique, inktober, pen and wash, pen and watercolour, philips, radio, retro, sketch, sketchbook, vintage, watercolor, watercolour by kathrynhockey. Bookmark the permalink.